Paint, Paint, and More Paint! >> Paint, Paint, and More Paint! Homes can be freshened up and given a new sparkle by painting it. Here is all you need to know about paint types and what to choose. And, for information about what paint colors affect the value of your home, click Impact of Colors on Home Value. When it comes down to it, paint is either oil-based or water-based, meaning that the paint’s main ingredient is either water or a type of oil (usually either alkyd or linseed oil). Drying and curing time takes longer. More durable than water-based paint. Cleaning paint brushes requires harsh chemicals like paint thinner. Often provides a much smoother and better-looking finish. Drying and curing takes less time than oil-based paint. Cleanup doesn’t require chemicals—soap and water works great. More common than oil-based paint (depending on where you look). Consider using oil-based paint on surfaces that take frequent beatings and abuse—like exteriors, floors, doors, trim, and furniture. Water-based paint, however, is great for things that won’t see a whole lot of wear and tear—like walls and ceilings. Water-based paint is also colloquially known as latex paint, even though this type of paint uses acrylic resins or vinyl instead of actual latex. Water-based paint is also the most common type of paint—usually around 75% of paint available at most hardware or paint stores is water-based, although it depends where you shop. Primer is an important component to the painting process, but you should understand that primer isn’t actually “paint.” It’s very similar in that it has the same consistency as paint and is applied the same way, but you would never use it as a final coat on anything. Applying a primer before applying the actual paint allows the primer to act as an adhesive of sorts for the paint to stick to, which adds durability and longevity. Furthermore, primer is pretty much required on new, clean surfaces that aren’t already painted. For example, if you’re painting a brand new wall that’s never been painted before, you’ll want to use primer. In other circumstances, primer may not be necessary. For example, if you’re painting over a previous paint job that uses a similar shade, you probably don’t need to apply primer first. If you’re painting a light color over a dark color, though, primer can be really helpful. You might need several coats of paint to completely mask the darker shade, but you typically need much less primer to cover it up—plus, primer is usually cheaper than actual paint and can save you a few bucks. In addition to oil-based and water-based paints, there are also different sheens of paint. In other words, paint comes in different levels of shininess (a.k.a. gloss). On one end you have paint sheens that aren’t that glossy. They’ll be called things like “Flat”, “Matte”, “Eggshell”, and “Satin”. Flat and matte paints are very similar, though matte is usually just a tad more glossy than flat. Matte is also usually more durable than flat. These types of paint are good for ceilings, as they can hide imperfections much better than higher-gloss paint can. Eggshell and satin paints are a bit more glossy, but still look fairly matte if viewed at the right angle. These types of paint are a good compromise between durability and sheen. So if you want something that’s durable but still looks fairly flat, eggshell and satin paints are good options. Semi-gloss and gloss paints are the most durable of sheens and they can take a good scrubbing without rubbing off, so they work well in kitchens and bathrooms. However, they do reflect light quite a bit and provide a shiny surface, which can make small imperfections stand out. The type of sheen you should use is ultimately up to you, though—just be aware of the pros and cons of each. While browsing paint at the store, you might come across some cans with the word “enamel” written on the label. In general, enamel paint refers to any paint that has incredible durability and dries to a tough, hard finish that can withstand a lot of abuse. 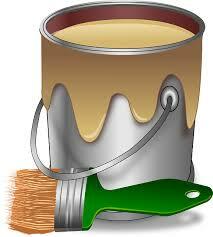 If a paint can label has the word “enamel”, you can be sure that it’s some of the toughest paint around. In the past, most (if not all) enamel paint was oil-based, but in recent years many water-based paints have taken on enamel as well. Personally, I swear by using an oil-based enamel, since oil-based paint is naturally durable in the first place. Enamel paint usually comes in the form of exterior paint and high-temp paint, as well as some indoor paints aimed at surfaces that see a lot of abuse, like kitchen cabinets or furniture.